We love seeing masters at work here, In terms of inspiration it’s just incredible to see the passion of someone who’s been doing what they love for year upon year. 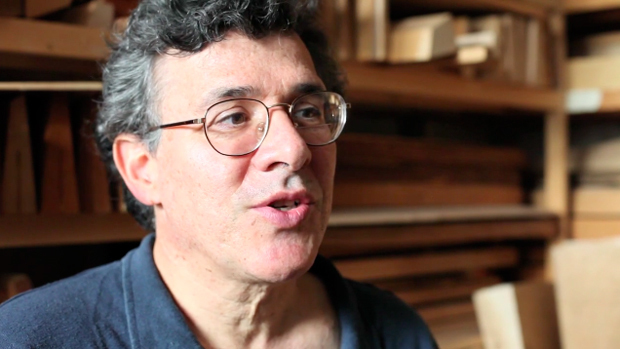 This would be a fitting description of Brooklyn based Violin Maker Sam Zygmuntowicz who we get to see under the microscope in this fantastic short film that filmmaker Dustin Cohen has put together. There’s something quite special about a Violin, I don’t think you can match it’s sound with any other string instrument, they’re really unique. Much like Sam who has dedicated himself to aiding the great musicians of the world, not just in creating instruments to a level of sheer excellence but helping maintain these so a note is never missed. I’m not sure if anyone has had the opportunity to see Woody Allens documentary on Philip Glass but I found myself drawing a few mental parallels as I watched this, Sam’s passion for what he’s doing seems on a similar scale. Also, I’m not sure if anyone else will pick up on this when watching but I found Sam to speak with such a conviction and clarity when talking about his profession, which is not always the case in these sorts of short docs. It’s interesting to hear him talk about the pressure he’s put under and how that gives him a clear view of what needs doing, a reminder to us all that nothing great is achieved without challenge. I really enjoyed this and we hope you will too, as the week winds down and we get a little time to work on creative projects it’s the perfect inspiration piece to welcome the weekend.